Output Of Hdpe (Kilogram per Hour) 35~40 KG/HR. 5 Ltrs. Single Station, Double Layer & View-Strip with 100 Point MOOG Parison Programming. 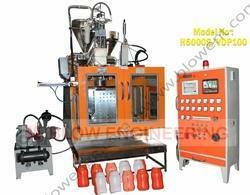 We have established ourselves as a renowned firm instrumental in offering Multi-Layer Blow Moulding Machine. The given product finds its application in making of multi-layer plastic containers. The machine is precisely engineered to meet the requirements of clients and producing best quality containers at minimum expenditure. • Easy to use hydraulic driven touchscreen plc controlled fully automatic suitable to make blow molding containers in PVC; HDPE; LDPE; PET-G, EVOH & PP materials. Looking for Double Layer Blow Molding Machine ?